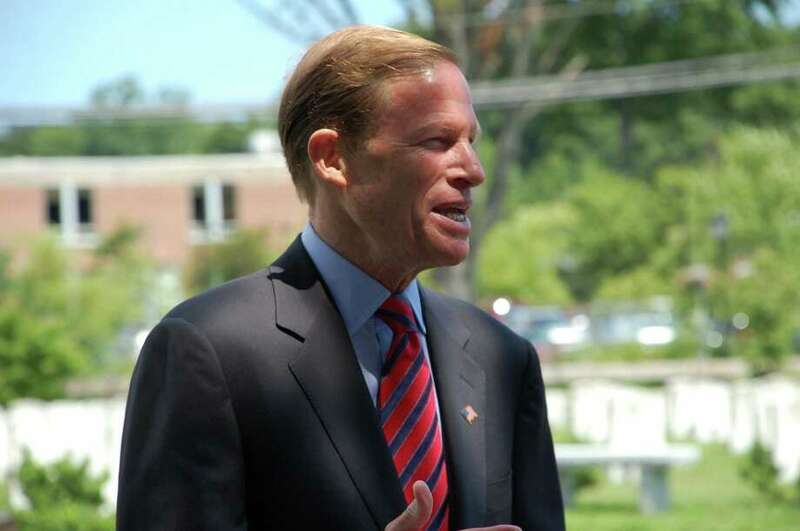 Sen. Blumenthal shares his thoughts at the Spirit of '45 ceremony Sunday. It won't be long before the dwindling number of World War II veterans will no longer attend the ceremonies in which they are honored. Sunday, however, gave several the chance to experience firsthand the recognition for their priceless contributions, and to remember the people with whom they fought for freedom more than 65 years ago. A wreath-laying ceremony was held at Spring Grove Cemetery in Darien to commemorate the Spirit of '45 -- a national celebration aimed at honoring the service of World War II veterans. "Everybody remembers the Spirit of '76 because it was a time of great sacrifice for the greater good," said Vietnam veteran Phillip Kraft of Darien, post commander of the Darien VFW. "The same thing happened around the time of the second World War." "They're not making these guys anymore, to put it simply," he said. "Most of the guys that are still alive are in, and approximately around, their 90s." "It's important because there ain't many of us left," said John Geoghegan of Darien. "We're dying off something like 6,000 a week." The event was organized by Atria Senior Living Darien, which has 14 World War II veterans, said Becky Gallucci, engage life director. "The Atria veteran's group is conducting a wreath-laying ceremony to pay tribute to the Greatest Generation," she said, noting that there was a national goal of having 1,945 separate ceremonies around the country playing "Taps" on this one day. Darien's short ceremony included a reading of the 2010 congressional proclamation for the observance of Spirit of '45 Day on the second Sunday in August. Along with a dozen World War II veterans present and several supporters, U.S. Sen. Richard Blumenthal came to share remarks. "You have been a model for other generations," he said, noting that his two sons had joined the military through these veterans' inspiration. "You have led by example, and I come here to say very simply, thank you," he said. "Thank you for the gift of our country." "These are the men who saved the world from tyranny," said Anthony Montimurro, a Vietnam vet from Stamford who volunteers with Bugles Across America and played "Taps" during the wreath-laying. "These are the guys and women who saved everybody." "Today, and throughout the week, communities across America are paying tribute to these ordinary heroes of the past century by remembering what they achieved," said John Boland, who served in the Navy in the Pacific, told the crowd. "I think it's important for the young people to understand that this group is just part of the old timers and we hope it's never repeated," he said later. "I don't think the kids have any idea -- the high school kids -- the immensity of what happened." Boland himself joined the service at age 18, having no real idea of what he was getting into. "It is our hope that our children and our children's children will always remember this generation," he said, "and will continue to draw strength and inspiration from their example of national unity, cooperation, integrity, courage and selflessness as we face the challenges of today and the future." Closing comments came from Jason Braase, of Manhattan, N.Y., -- a veteran of Iraq who was wounded and spoke on behalf of the Wounded Warrior Project. "I stand before you with no regrets," he said, citing the example of his grandparents' World War II service in inspiring him to enlist. "I can't even begin to tell you how honored I am to be part of your group of service members."